Hi, this is not my own, I just want to share with other people and backup for me to easier re-study when i need. If you don’t like this post, you can go to here to read the main post ! For real time games the above problems are especially relevant and if not handled correctly will result in players experiencing “lag”. Before diving into the networking solution that Unity offers, lets briefly look at the history of multiplayer games and their networking solutions. Initially, each computer exchanged game information with each of the other computers in a star topology. The game consisted of “turns” and in each turn a computer could choose from a limited number of “moves”. Once all the computers had communicated their next move to all the other computers, each computer carried out the moves after which it was time for the next turn. Assuming that all computers started from the same initial game state, this would ensure that all games played out identically across computers. The disadvantage of this networking solution is that each computer has to wait until it has received the move from the last computer, the slowest computer thus determing the pace of the turns (and thus lag). Real Time Strategy games typically use variants of peer to peer lockstep, albeit with better handling of the lag issues. To avoid having to wait on the slowest computer, each computer now communicates with a single server. The server has the game “world” and the clients just receive a view on this world. The clients have (almost) no code, they are just dumb terminals sending input (key presses) to the server. The server then carries out the input and sends back a “picture” of the resulting world. There is no longer a problem of keeping the game world consistent across computers as there is only one world (on the server). The solution works fine for computers with the same low network latency but begins to fall apart when players have higher, differing latency. For players with a high latency, the game quickly become unplayable, the world moving in jarring jumps. Doom worked like this and if you had a high latency then most chances were you were dead before you had a chance to see what hit you. To smoothen the game experience, clients no longer wait until they receive a view back from the server. They take the players input and predict what will happen, immediately updating the world view accordingly. This requires the client to know about the game mechanics and game objects, thus the client is no longer dumb. The resulting game play is much more responsive. Of course, a problem occurs when the server world view comes back and differs from what the client predicted. The world view is then yanked back in line with the server view, often causing a noticeable glitch. This solution was first introduced in Quakeworld. Reverting to the server state when a client prediction is off, actually means that the world view of the client jumps back in time. To understand this, say that it took 200 ms for the client input to reach the server, and another 200 ms for the resulting world view to come back from the server. The client has in the mean time moved forward 400 ms in time using it’s own predictions. If the client has to revert to the server view resulting from it’s input 400ms ago, it is thus jumping back in time to the time of that input. To avoid this, the client would have to first rewind time and then repredict forward in time to reach the current time again. If the game play mechanics are reasonably deterministic then corrections will occur rarely as server and client are calculating the same world view. Input from other players is basically the only cause for correction, such as the firing of a rocket point blank at the back of the head. 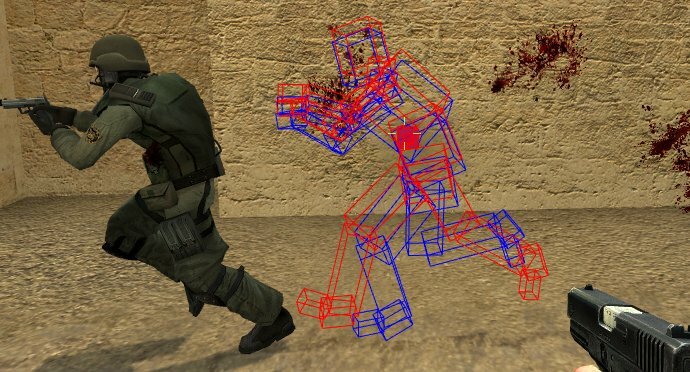 This solution results in smooth, responsive gameplay and was first introduced in CounterStrike. As a side note, clients can be authorative in that they are allowed to process the players inputs and update the world themselves. In this case, the server does not own the world, it just serves to update the world according to views from it’s clients and distribute these views to the other players. While this ensures that game play is responsive, it can lead to clients having different conflicting world states requiring solutions to resolve these conflicts. It also introduces the risk of cheating clients, one player claiming to have shot another when he didn’t even have a gun, for example. This networking solutions is seldom (if ever) used for games. Sometimes a peer to peer solution, with one of the clients being both server and client, is called a non authorative server, but typically the client-server is authorative. The last parameter to the Network.InitializeServer() function (false in the code above) indicates whether or not the server should use NAT punchthrough to enable clients to connect with it. See the Network Overview for more details. For now, leave this at false. The function Network.Disconnect() stops the server. A NetworkPlayer is a datastructure containing information about a client (such as the ip address and port). Network.connections returns a list of all connected NetworkPlayers. To finish the server side, create an empty GameObject and add the ServerMain.js script to it. You should now be able to start and stop the server. Before we build the client side code, we first need to configure Unity to allow both the client and the server projects to run on the same pc. This is easy for development and debugging purposes. Unity does not allow the same project to be opened more than once. It also automatically reopens the last project you edited. This combination means that if you have any project open in Unity, clicking on Unity again will result in an error message. This can be avoided by selecting Edit > Preferences from the main menu in the Unity editor and then check “Always Show Project Wizard“. Unity will now no longer automatically reopen the last project, but allow you to select the project yourself on start up. You should now be able to open both a server project and a client project. By default, Unity will only run the project when the game view is active (the mouse is in the view for example). If not active, the code is paused. This is a nuisance if you have a server and a client project open at the same time and are switching between them for development/debugging purposes. 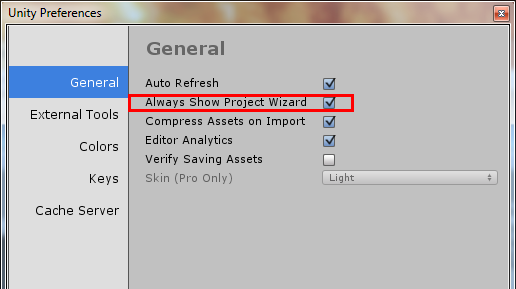 To get around this, select Edit > Project Settings > Player from the main menu in the Unity editor, and select Run In Background in the PlayerSettings inspector. If you now run the server project, it will not stop running when the mouse leaves the game view screen. Remember to do this for both the client and the server projects. Note that as an alternative, bulding the server (.exe) and the client (.exe) projects and running the resulting executable also allows you to run both client and server at the same time on the same pc. This is the default ip for localhost (the pc you are running on). This will work fine if the server is also running the same pc, but otherwise this should be set to the actual global ip address of the server. The second parameter is the (remote) port of the server and should be identical to thelistenPort in the ServerMain.js script. The function Disconnect() is used to disconnect from the server. This code snippet uses the connectToServer() and disconnectFromServer() functions defined above. In addition, it adds some buttons to connect/disconnect to the server, and shows some status information using the Network.peerType. To complete the client, create a new empty GameObject and add the ClientMain.js script to it. Run the Server project and press the “Start Server” button. Now run the Client project and press the “Connect to Server” button. If you are seeing something comparable to the above screenshot then congratulations, you have successfully built your first networking solution! The client server example above allows a connection to be established between server and client, but it doesn’t yet do anything useful. To improve, let’s first discuss the UnityNetwork View component. This property determines the Component of the GameObject for which information will be sent over the network. This is a drop down allowing either a Transform, anAnimation, a RigidBody, or a script to be selected. For the selected Component, all the state information required to “recreate” the state of the Component on a different client is sent across the network automatically (by default information is sent 15 times per second). Unity handles all of this information sending and recreating for you, thereby ensuring that all clients see the same state. This property determines how information about the GameObject will be sent over the network. One option is Unreliable which means that all the state information about the Observed component will be sent every time (15 times per second). It is called unreliable because if the information is lost somewhere in the network (due to packets being dropped by a router for example) then it is not resent. For a real time racing game, such loss is quite acceptable as any resent information will be too late anyway. As long as the next packets contain the complete state again, the game can recover. Another option is Reliable Delta Compressed. In this case, not the entire state information is sent every time but only the information that has changed since the last send (hence “delta”). It is called reliable because any information lost in the network is resent and is guaranteed to arrive at all clients. This is necessary because if any change packets are lost then the state on the remote client goes out of sync and any subsequent change packets are unusable. Sending only changes instead of the total state saves on bandwidth but the resending introduces delay, making it less suitable for real time games. Besides the prefab, the function also requires the position and rotation of the prefab. The last parameter denotes the Communication Group. This allows clients to be split into different groups and the prefab would only be instantiated on clients in that group. This aovids having clients that are nowhere near each other in the game exchanging useless information. Instantiate() can be called by any client and/or the server, but whoever makes the call “owns” the instance. This means that if Instantiate() is called on a client, this client is authorative for that instance and can change the position and rotation etc. Other clients can cheat by modifying the position of the instance, but these chances are only local to that client and are not communicated across the network (and are overwritten by changes made by the owner). We will be building an authorative server solution, so all calls to Instantiate need to be made on the server. To demonstrate the Network View and Network.Instantiate(), let’s extend our client-server solution so that a player gameobject is spawned every time a new client connects to the server. In the server project, create a folder called “Server” in the Project View and drag the script ServerMain.js into this folder. This folder will contain everything that is needed only on the server side. Also, delete the GameObject from the scene. Create a second folder called “Game“. This folder will contain everything shared with the client project. Save the scene and call it “Game“. 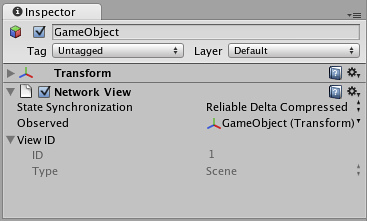 Drag the “Game.unity” scene into the “Game” folder. Add a Plane GameObject to the scene with Position (0,0,0), Rotation (0,0,0), and Scale(1,1,1). Make sure the Main Camera shows the plane, for example Position (0,1,-10) andRotation (0,0,0). Add a Directional light to the camera and set the Directional light toPosition (0,0,0) and Rotation (0,0,0). Add an empty GameObject called “GameController” to the scene. Select theGameController and add a NetworkView component by selecting Component > Miscellaneous > Network View from the main menu. In the Inspector, set the State Synchronization property to “Off“, and the Observed property to “None“. This GameObject will serve as a global placeholder used to attach scripts. Why we need aNetworkView here that is doing “nothing” will be explained later on. Now we will create a simple cube prefab which will serve as our “player” object. To do this, add a Cube GameObject to the scene. Rename the cube to “Player“. Add aRigidbody component and also a NetworkView component. In the Inspector, drag theRigidbody component onto the “Observed” property of the NetworkView component. Also in the Inspector, tag the object as “Player“. Finally, drag the cube from the Hierarchy view into the Project view. This will create a prefab called “Player” in the project’s Assets folder. Move this prefab into the Game folder and delete the original Player GameObject from the scene. Drag this script from the Project view onto the GameController object in the Hierarchyview. Select the GameController to view the Player Info (Script) in the Inspector. 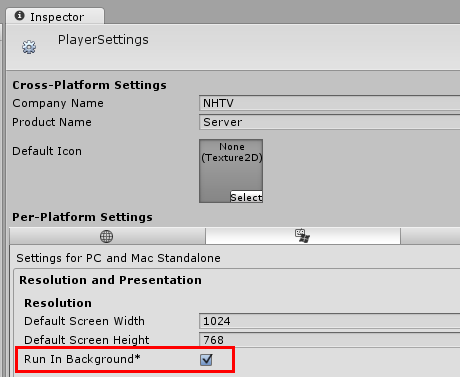 Now drag the “Player” prefab from the Project view onto the “Player Prefab” property in theInspector. This script serves as a “global” placeholder for the player prefab that the clients will instantiate when they connect. We have now finished the shared “Game” folder. All that is left to do is to export the folder and (later) import it into the client project. To do this, select and right-click the “Game” folder in the Project view and select “Export Package…” from the pop-up menu that appears. The Exporting Package dialog will appear. 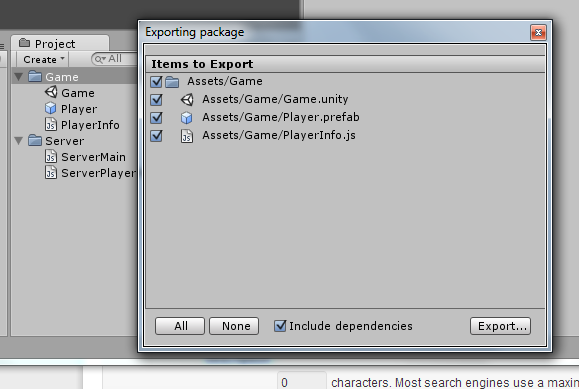 Click the “Export…” button and save the Unity package as “NetworkGame“. We will continue with the client project later on, but first we will complete the server side. This code finds the PlayerInfo script (global placeholder) we created above and uses it toNetwork instantiate the Player prefab (the cube), positioning it 3 units above the plane (Vector3.up*3) so that it will initially drop down to the plane (it’s a rigid body, so it will be affected by physics). The cube is not rotated (Quaternion.identity). The group parameter is set to 0 which means send to all clients (we are not using groups). To finish the server side, drag both the ServerMain.js and ServerPlayerManager.jsscripts onto the GameController object. Switch to the client project and create a folder called “Client” in the Project view. This folder will contain everything that is needed only on the client side. Drag the ClientMain.jsscript into this folder. Also, delete the GameObject in the scene. 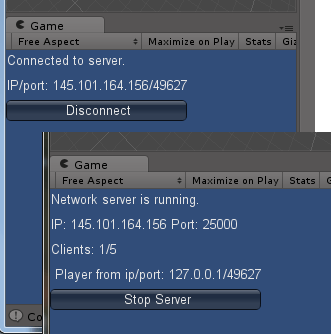 Now import the NetworkGame.unitypackage you exported from the server project. To do this right click in the Project view and select Import Package > Custom Package… from the pop-up menu, then browse to the location you exported the package to. 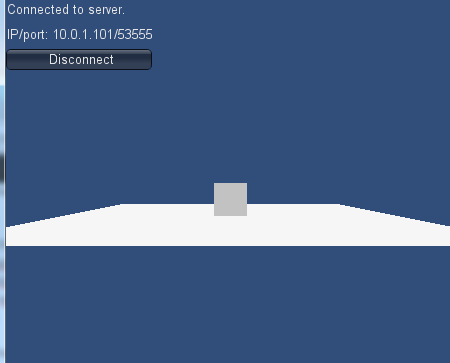 Open up the Game scene, and drag the ClientMain.js on to the GameController object in the Hierarchy view. Press run in the server project and press the “Start Server” button. Now press run in the client project and press on the “Connect to Server” button. You should see a cube drop down onto the plane in both the server and client game views. Select the Player(clone) in server scene hierarchy and use the inspector to modify the position (change the x to 3 for example). You should see the cube change position on both the server and the client. 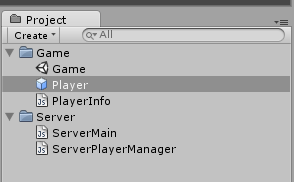 Select the Player(clone) in the client scene hierarchy and change it’s position likewise. The cube should now only be modified on the client side, and not the server side. In fact, if you now change the server side position again, the client side will jump to the correct (server) position again. This clearly demonstrates that the server is authorative. In the client game view, press the “Disconnect” button. You will notice that the cube on the server and the client side remain where they are. Press the “Connect to Server” button again. You should see one additional cube spawn on the server side and two additional cubes on the client side, making the total number of cubes on the client side three. If you repeat this a couple of times, you will soon have cubes exploding all over the place! To understand why this is happening, we first need to discuss Remote Procedure Calls (RPC) and how they are implemented in Unity. Remote Procedure Calls, or RPCs for short, are function calls made over the Network. This allows a client to call a function on a remote server, or vice versa, for example. Notice the @RPC attribute placed before the function declaration. This tells Unity that this function can be called remotely. The first parameter of the RPC() call is simply the name of the function to call. The third parameter is the parameter for the function call, i.e. the above call is equivalent to locally calling PrintText(“Hello world”). Server: Sends to the server only. The RPCMode allows an RPC call to be either unbuffered (Server, Others, All) or buffered (OthersBuffered, AllBuffered). Non buffered calls are carried out and then forgotten. Buffered calls, on the other hand, are never lost but are stored by the server in an ordered stack. When a new client connects, all the buffered calls are carried out on the new client (in order). This allows the game state to recreated on a client who comes into a game that has already started. Whenever we make a call to Network.Instantiate(), Unity makes use of buffered RPCs underwater. This ensures that when new clients connect, all the instantiated game objects (player instances etc.) will also be created on the new client. Firstly, the network communication required for RPCs is handled by a NetworkView. This means that the script containing RPC functions must be attached to a GameObject that also has a NetworkView component. This is why we added a NetworkView to the GameController object in the projects above. The GameController is a dummy placeholder and so we don’t need to synchronise the state (position, rotation etc) of the object. However, the script calling Network.Instantiate() (and thus making RPC calls underwater) is attached to the GameController. For this reason, it requires a NetworkView, but the State Synchronisation property can be set to “off” and the Observed property to “None”. Returning to our client and server projects, we can easily understand the spawning madness we get when the client disconnects and reconnects. When the client connects for the first time, its Intantiate() call is buffered. When the client disconnects and connects again, it triggers a new Instantiate() and it also gets the buffered Instantiate(), thus leading to two cubes. A third connect, would lead to three cubes, and so on. To avoid this problem, the server needs to clean up the buffered RPC calls for clients that have disconnected. However, that is not all. On the client side, the client has to clean up its old cubes before connecting again. The sever cannot do it for the client because it is no longer connected. We can then use the Destroy() function to delete these old player cubes. To improve the server side spawning and cleaning up when a client disconnects is a little more complicated. The reason for this is that the server needs to keep track of which cube instance belongs to which client. This allows the server to delete the right cube when a client disconnects. This instantiates a new cube when a client connects, and places the cube instance in a hashtable, using the NetworkPlayer as the key. which clears away any buffered RPCs belonging to the cube’s NetworkView. This will ensure that new clients connecting will not instantiate a cube for the disconnected player. This is basically the network version of the local Destroy() function. This uses the private variable instance of the ServerPlayerManager.js script initialised earlier. Start up the Server and the Client projects, and try connecting and reconnecting the client. Spawning and cleaning up of the cubes should now work as expected. Try building the client to create an executable (.exe) and also running this a number of times so that you have more than one client connecting to the server at the same time. To complete this introduction tutorial, lets improve our networking solution to allow the clients to move their cubes about. To do this in an authorative server solution requires the clients to send their input (key presses etc) to the server. The server will then update the world (ie the position of the clients cube) and send the result to all connected clients. This is an RPC function which can be called by the clients remotely. It basically finds the cube belonging to the player and then updates the position depending on the value of the “vertical” and “horizontal” parameters the client sends. followed by the values of vertical and horizontal. Note that RPCMode.Server is used, meaning that the RPC call should only be sent to the server for execution. The reason that this dummy (empty) function is needed is that Unity requires the client and the server to both have the RPC function, even if it is only going to be called on the server. 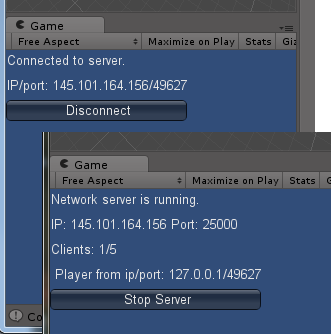 This is a typical for Unity networking in that Unity seems to prefer the client and server code to be combined into one and the same project. This would favour the peer to peer networking model, where a client can host a game and be the server as well. In this tutorial, we have split the client and sever code into two projects. This serves the purpose of clarifying what the server does and what the client does. Run the server and connect with one or more clients. Each client should now be able to move it’s own cube (but nobody else’s). The server should not be able to move anything. Try bumping one cube into another and see that the server side physics (the cubes are rigid bodies) handles all the collisions. Congratulations! You have now completed this introduction to Unity networking. You can download the two projects directly here.